This is an impressive stout. Obvious coffee flavor, with a nice creaminess and hints of chocolate. I could drink this one all day. Smells and tastes like the original going down, pretty fruity, but not overwhelming. Then you get some hops in the finish that stay with you after you put it down. Great beer. This is another typical Magic Hat brew. The "black lager" name (and taste) make it slightly different from other beers of its type, which makes it better than your average beer, and in this case, the label makes you want to buy it. A little noticeable bitterness in this IPA, but it really does have a ton of flavor to balance it out. Citrusy mostly but also some piney notes to round it out. Really good. This is definitely low key. Not enough flavor, not enough hops, not enough bitterness. I understand the desire to have a session beer, so I'll give that part a pass, but don't skimp on flavor. This is a pretty generic IPA that isn't all that strong. This beer doesn't really have a category. It tastes floral, kind of like an IPA, but it isn't that strong or bitter. It's worth trying. This is not what I wanted from a craft brewery. As far as super pale lagers go, this is fine, but if I'm going to get something like this, I'm going to pay a lot less and get something similarly tasteless. This is a lot like Dogfish Head Indian Brown Ale. It is hoppy, but still has the sweetness of the brown ale. I prefer the Dogfish version, but this one is still pretty damn good. This is a pretty solid summer beer. No complaints, decent amount of flavor, best enjoyed very cold. Ginger dominates the flavor of this one, but isn't overwhelming, as ginger can be. Just a refreshing beer that would be great to have outside. This is the opposite of what you normally get with an IPA. It tastes and smells hoppy going down, then finishes bright and citrusy, almost fruity. Not what I expected, and quite delicious. This is not the best beer you'll ever have. It tastes a little off, but at least it's strong, so it'll get you where you need to be. This smells nice and malty. When drinking, you start to get the malt flavor, then get overwhelmed by hops. It is not the best combo. This is easily the worst Magic Hat beer I've ever had, because this is the first one I haven't loved. It tastes just OK, but I can't stand the smell. Only worth buying if it is part of one of their variety packs. This is a solid stout. 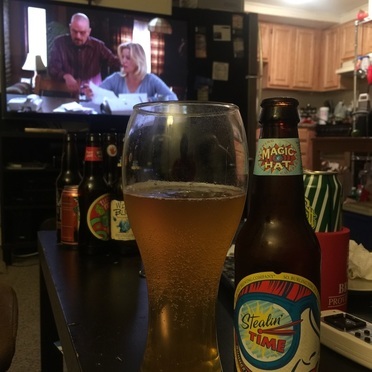 It has a good amount of vanilla flavor, isn't too heavy, and doesn't taste too strong. Pretty nice soothing winter beverage. There is nothing wrong with this one, but it doesn't have enough flavor or alcohol to keep me coming back. Really crisp beer that has a little yeasty pop almost like a saison. Wasn't expecting that, and I really enjoyed it.